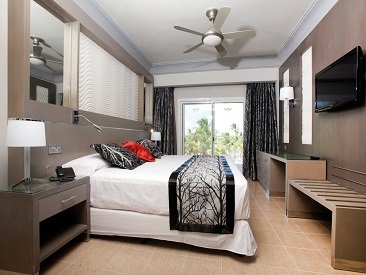 Riu Palace Macao is an all-inclusive, adults-only (18+) hotel in the Riu Resort complex, located in beautiful Punta Cana. Elegance and comfort meet an abundance of activities, setting the tone for a perfect vacation. 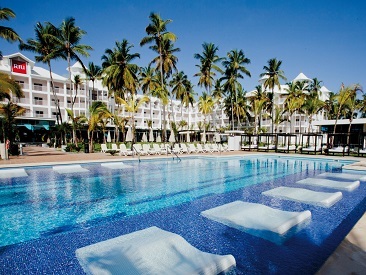 Colonial inspired architecture, elegant guestrooms, Junior and Jacuzzi suites and a tropical landscape combined with four restaurants and bars, a large pool and a host of recreational options for a fun, active adventure in this Dominican paradise. A beachy paradise plus a full-service spa and fitness center, water sports both motorized and non-motorized, and nightly fun and entertainment — a disco provides all night fun, and Riu Palace Macao guests enjoy privileges within the RIU resort complex. 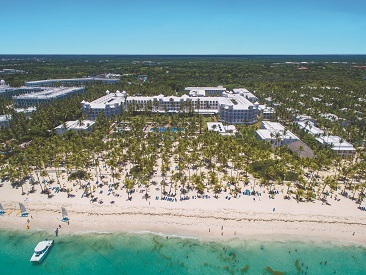 As the centerpiece of the sprawling RIU Resort Punta Cana, guests of the Riu Palace Macao may avail themselves of the many facilities at both Riu Bambu and Riu Naiboa. In keeping with the exclusivity of the Riu Palace Macao, guests of the other hotels in the resort complex are not permitted to use the facilities at the Riu Palace Macao. Caribbean Street is RIU's popular dining, shopping and entertainment strip. RIU complex guests will love this unique shopping and late night entertainment area, which is strategically located away from the guest rooms and villas. At Splash Water Park, the Body Vortex, a closed body slide that shoots you towards the pool, the Kamikaze, with impressive drops from various heights, and the free-fall slide, for experiencing a unique sensation, await you. Riu Pool Party - Now Open! The RIU Pool Party has started in Punta Cana! This new area will host large parties 4 times a week with local and international DJs, exciting lighting and sound effects and 4 poolside bars (including a poolside bar and a snack bar). Each week will offer a Jungle party, a Pink Party, a Neon Party and a White Party, and every party will have its own unique vibe. These parties are part of the all-inclusive package and are open to all RIU guests 18+ staying at Riu Palace Macao, Riu Palace Punta Cana, Riu Palace Bavaro, Riu Bambu and Riu Naiboa, so come out and enjoy the fun! (2) $35 coupons to be used toward Ocean Harmony "Special for Couples"
(1) $10 coupon per person, per night. Coupons are per golf round per person and include: transfer from hotel to golf course and back, 18 holes of golf per round; practice balls, electric golf car, water, soda and cold tower at the end of the tee time. Applies towards Royal and Caprice Wedding Packages. * *Limited to 1 coupon per wedding. Applies only for weddings paid directly at the hotel. Cannot be used with prepaid weddings. (3) $15 coupon per room to be used toward midsize car rentals. Applies 1 coupon per day per car. (3) $20 coupon per room to be used toward SUV rental. Applies 1 coupon per day per car. (1) $50 coupon to be used toward the Sea Package, which includes: 40-minute photo session with professional photographer, 25 pictures in a CD format + 1 6x8 printed photo.